Frederick Douglass, the “Prophet of Freedom,” was a prolific writer and speaker whose legacy of activism continues to inspire the world. The Gilder Lehrman Institute is fortunate to have several original Frederick Douglass documents in its Collection and has amassed many scholarly responses to the life and work of the escaped enslaved man turned abolitionist leader. 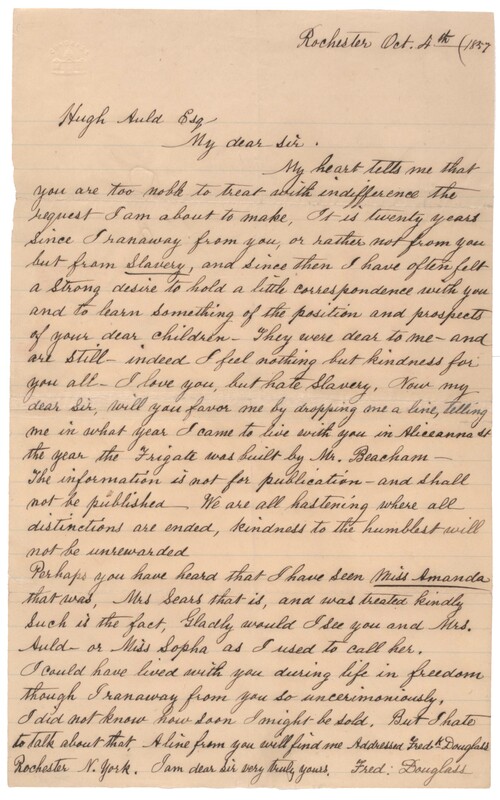 In 1860, Frederick Douglass wrote to his former owner to say he loved him but hated slavery. In 1870, Douglass wrote to Thomas Burnett Pugh, a former abolitionist about the racism he encountered in the North. In 1880, Douglass wrote a tribute to Abraham Lincoln. In 1887, Douglass attacked the unwritten new laws of the South and the Jim Crow laws that continued to marginialize and oppress African Americans. In 1888, Douglass wrote about the disfranchisement of black voters. In “Frederick Douglass at 200,” the winter of 2018 issue of History Now, the online journal of the Gilder Lehrman Institute, we featured five major articles by leading scholars in celebration of Douglass’s 200th birthday. Admiration and Ambivalence: Frederick Douglass and John Brown, an essay by David W. Blight focusing on correspondence between Douglass and other abolitionists, detailing the relationship between Douglass and Brown in the leadup to and aftermath of Brown’s raid on Harper’s Ferry. “The Merits of This Fearful Conflict”: Douglass on the Causes of the Civil War, an essay by David W. Blight focusing on Douglass’s remarks at Arlington National Cemetery in 1871, reminding the assembled listeners that the Confederacy had fought the Civil War to preserve slavery. “Hidden Practices”: Frederick Douglass on Segregation and Black Achievement, 1887, an essay by Edward L. Ayers focusing on Douglass’s letter to an unknown recipient from 1887 about the struggle in the South. In the Institute’s video collection, Yale professor and author of 2018’s Frederick Douglass: Prophet of Freedom, David Blight, discusses Frederick Douglass and Abraham Lincoln and the Importance of Frederick Douglass, while Dickinson College professor and Lincoln scholar Matthew Pinsker explores Frederick Douglass’s Reconstruction Era statements about President Linoln. The Gilder Lehrman offers a Frederick Douglass Traveling Exhibition for education- or community-based organizations in the continental United States. Among the highlights are a broadside entitled Slave Market of America from the American Anti-Slavery Society, passages from Douglass’s first autobiography, Narrative of the Life of Frederick Douglass, an American Slave, and a letter from Douglass to Hugh Auld, whose family held Douglass as a slave. In partnership with the Gilder Lehrman Center for the Study of Slavery, Resistance, and Abolition at Yale University, the Institute awards the annual Frederick Douglass Book Prize of $25,000 for an outstanding nonfiction book in English on the subject of slavery, resistance, and/or abolition. 2018 was the 20th anniversary of the Prize, which has been awarded to co-winners Erica Armstrong Dunbar for Never Caught: The Washingtons’ Relentless Pursuit of Their Runaway Slave, Ona Judge (37Ink/Atria Books) and Tiya Miles for The Dawn of Detroit: A Chronicle of Slavery and Freedom in the City of the Straits (The New Press). The award ceremony will be held on February 28, 2019, at the Yale Club of New York City. 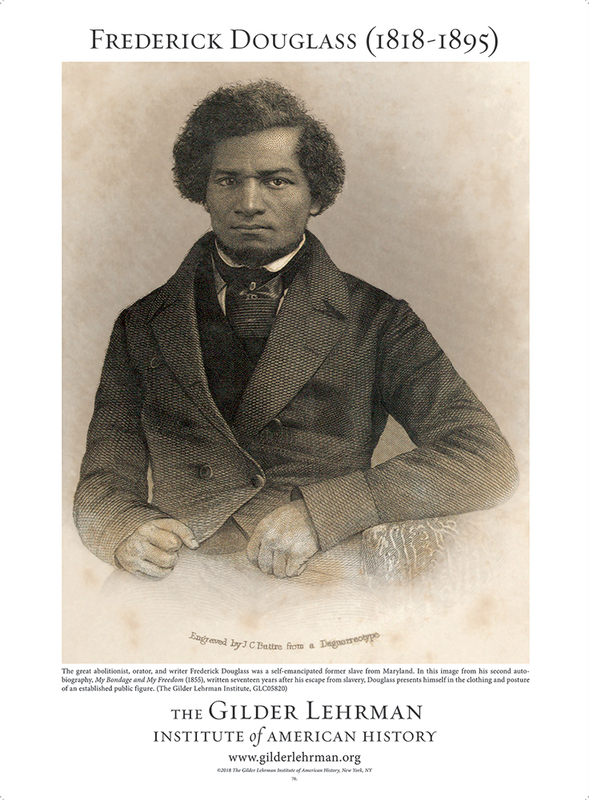 Visit the Gilder Lehrman History Shop for Frederick Douglass: A Life in Documents, a compilation of essays by leading scholars focusing on documents in the Gilder Lehrman Collection and a poster depicting a young Frederick Douglass.